I have always been fascinated by the way positive, successful partnerships have influenced our lives. 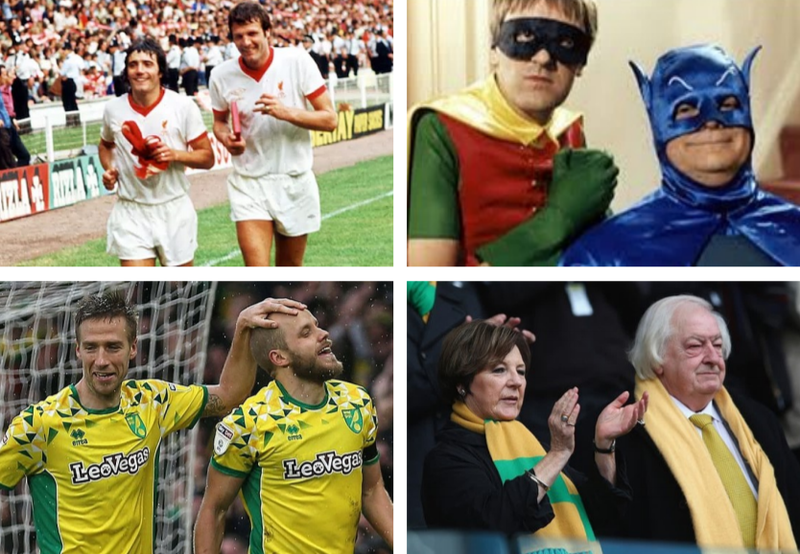 Think back to some of the great partnerships: Morecambe and Wise, The Two Ronnies, Del Boy and Rodney, Batman and Robin (see the link there), Trueman and Statham, Hobbs and Sutcliffe, I could go on and on and you will all have your particular favourites. In our great, unforgettable season, the successful partnerships on and off the field have boosted performance to almost unprecedented levels. We have had great partnerships in the past of course. Who can forget Malky and Flem in 2004? Or the perfect storm on and off the field with Messrs McNally, Lambert and Holt in recent times? Unforgettable, yes, but the partnerships this season are in a different stratosphere, both on and off the field. Let’s take the team first: Zimm and Godfrey forging such a contrasting partnership which is keeping seasoned, brilliant pros Hanley and Klose out of the side! If it goes wrong, Mr Krul lets them know in his own unique style. Our staggeringly good full backs, linking seamlessly with Emi and Onel, ensure danger with every attack, and confirms that partnerships can get better and better. The midfield axis has had various partnerships through injuries, but each has brought a vitality to the team. Tom Trybull is now the common denominator ably assisted by Vrancic, Leitner, Tettey and now King Kenny. What a choice for Farke. Finally, the key, and arguably most unexpected partnership, Pukki and the mercurial Stieperman. Those of a certain vintage will remember Toshack and Keegan in the 1970s at Liverpool who had the most unbelievable understanding. They were the classic big man, little man with devastating results. I defy anyone who would have predicted the extraordinary partnership that Teemu and Marco have forged. Clever, instinctive, creative, magical, baffling and quite frankly, one of the best if not the best partnerships I’ve seen in the yellow and green. Yet within these obvious links, others emerge, mostly around our wonderful little Argentinian. So, on the field partnerships are one thing but they cannot emerge without the partnerships off it which are just as important. I remember Stuart Webber saying at an NCFSC event in August that he speaks every day to Daniel Farke. What a partnership they are! Brutally honest, as indicated by various interviews during the season, these two obviously have total trust in each other and what they want to achieve. That trust is transmitted openly to the fans who are repaying them by getting behind the team, enhancing the notion that we are all in this together. And I cannot omit the partnership off the field which has been a constant over our recent history. Delia Smith and Michael Wynne Jones have been stewards for the club through thick and thin and endured criticism, some deserved, at various times. However, nobody can ever fault their genuine commitment to this wonderful club and one only has to look at the ownership of some other clubs, to realise what a special partnership this is, and how damned lucky we are to have them. So, will these special relationships, on and off the field bear fruit? Who knows but one thing I’m certain of… it deserves to. I’m surprised you didn’t pick a couple of partnerships closer to home: Boyer and McDougall and Bly and Crossan. Spot on MIke, our Government could learn a lot from your observations. There’s also the Daffodils all over my lawn, ‘Yellow & Green’ of course, another great double act. We have the most exciting few weeks ahead and the next 3 games will be massive, can’t wait for Saturday now. How do you manage Tramadol? They cause me sickness within 30 mins,a bit like City under Hamilton & Roeder! I spoke in a comment the other day about team work. inside that are the partnerships, that are forged on a different level. Yes there are indiviuals we could mention past and present. but they would not have had the impact without the partnerships inside the whole Team work . I guess I’d add Watson and Bruce plus Lewis and Aarons (in the same sense as Bowen and Culverhouse) to your list. I have been trying to make out they were my pics Martin!😂Totally accept your point but was conscious of focusing on the present team for the article. As I said everyone will have their own favourites. Really appreciate your comments. Huckerby and Drury would probably be my favourite! Two excellent players, whose widely contrasting attributes combined to make a memorable partnership down the left.